This collection contains 135 registration settings covering 25 favourite Christmas songs and carols. The package also includes two banks of church organ registrations for those who prefer their carols in a more traditional style. The registrations in this collection are essentially 'Plug 'n' play' and were created from the sounds and styles contained in a brand new Tyros5 keyboard. Although some 'tweaking' of the original sounds has been done - using style voice and DSP edits - this software doesn't include any style or voice sample data. 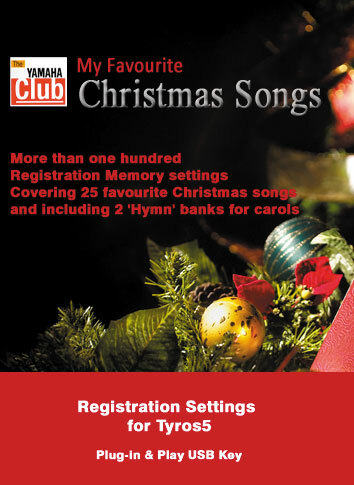 The registrations are loaded into the Tyros5's eight Registration Memory buttons - 1 bank for each song title. Depending on the requirements of the song, as many registration buttons as needed have been used - but not necessarily all eight in the bank. Registrations are included for the following song titles (music not included). Plus bonus demonstration mp3 audio tracks.